"Mama...", says Hyoga softly, laying a bouquet of flowers on the ice field in the middle of the Siberian Sea. Hyoga thought he'd never come back here to this place again, this place where her Mother's dead body lies, this place where Hyoga comes to comfort himself. In the past, he would always break the ice and dive into the freezing waters and swim down to the sunken ship that took away his Mother. He would deliver her favorite flowers and lay them beside her, spending time with her, but he has not done that since the 12 Temple Fight. and not act unbecoming of a Saint. Standing there, he can feel the freezing air, so cold it can kill anyone who is not prepared for these temperatures. He is not wearing a coat though, because after so many battles, this cold is nothing to him even if it is ten times colder, using his Cosmo he can survive it. Hyoga looks up and he see darks clouds hovering. "Muh! ", groans Hyoga. He is not groaning because the dark clouds. He groans because he can sense disturbances around the world. Right at that moment, a bolt of lightning strikes the ice field! Cracking the ice, a man appears! "Cygnus! ", says the man, "I've come to invite you to meet Zeus!" "What...? 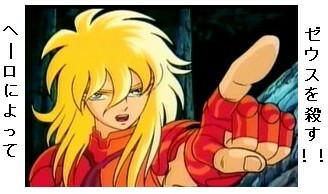 ", says Hyoga, flatly, "Who are you?" "Oracle...? ", says Hyoga, "So... Jacob was right..."
7 Days ago, Kohoutek Village. "Jacob, thank you! Your beef stew was delicious! ", says Hyoga sitting at the dinner table in Jacob's family's house. "You're welcome, Hyoga! I told you it would be delicious! ", says Jacob who finally got Hyoga to eat with him, Hyoga who prefers to be alone. "Let your family do the clean up... we must talk..."
"Your family told me about your nightmares... Tell me about it." At first, Jacob wanted to get away but finally he sits down and reluctantly, he starts talking, "It started 3 weeks ago when..."
Hyoga nodding, "When that Red Light appeared..."
"Yes... I kept dreaming about your death... That comet is a omen..." "Omen?" "As you know Hyoga, we Siberians aren't like many in the world who likes to see a comet. To us, it is a bad sign..."
"Jacob, You're a young kid! You sound like your grandfather... Besides, isn't that kind of thinking very old now... Even this Village, 'Kohoutek' is named after, Comet Kohoutek." "In the nightmare, I dreamed of a ladder..."
"A ladder taking you to Heaven..."
Power, Bastet, Sekhmet! Cygnus, join us!!" "Oi! ", says Hyoga, "I am a Saint of Athena!" "It doesn't matter... Of course! You won't become a Thundera like me. We the Thunderas and many other Oracles has been chosen from the Time of the Myths. Since that time, we can invite anyone who has similar abilities to join us! Anyway, you've met the qualifications of an Oracle." "And, what would that qualification be?" "You've already awakened the Eighth Sense. Zeus would love a powerful warrior like you... In fact, he already provided a Halo for you! " Right then, from the Heavens an armor descends. Hyoga looks at that armor. It is a man holding a cross with both hands and behind him is the Holy Spirt ready to possess the man. The Spirit has a pair of beautiful wings. "This is your Nativity Halo." Right then the Halo separates and Hyoga wears the armor of the Oracles!! "Such power!!" shouts Hyoga, "And I also sense something that is very different from the Cloths of Athena!!" "Yes. You don’t need your useless Cloth anymore. ", smiles Sekhmet, "Well, Hyoga, now that you are one of us what will you do?" "I will use this Halo..."
"I WILL USE MY HALO TO KILL ZEUS!!" "WHAT! SUCH INSOLENCE!!" Right then Hyoga uses his Cosmo and forces his Halo away from his body and the Halo disappears back to the Heavens! Hyoga smiles and says, "Bastet... My Cloth may be worthless to you but my Cloth embodies my friendship, my learning and the blood of many who..."
"Hyoga! ", shouts Sekhmet, "I'm not here to listen to you ramble on forever... If you don’t join us, you will die!!" "I DON’T THINK SO!! ", shouts a voice. "What!? ", shouts Sekhmet. Hyoga looks over to his left and he sees a Saint has appeared! "Huh! ", smiles Milo walking over to Hyoga, "Athena, she... "
"Scorpion! What about your Temple? You can come out of Sanctuary as you please?" "No, many of us recieved the order of dispatch. Athena knows that you Oracles, will continue to invite others to join you, not just the Saints, but more importantly, you will kill those innocent humans who have the potential to fight against you. Do you think Athena will allow that to happen?" "Hah! Yes... Before this earth is destroyed, a lot of lives will be lost... But answer me this, what about Athena, surely there aren't enough Saints to protect her?" "Athena has awakened the Kaiser Saints ... One of them is equal to a 100 Saints... "
"Kaiser!?" shouts Hyoga, "Oh! Can it be Master Camus always went back to Sancutary, he..."
"Kaiser? Whatever... Scorpion! A warrior like you will add great value to the Battalion of Zeus... Come! Join us!" "I told you before! ", says Milo, " I won't join you!! Hyoga won't join you! NO SAINT WILL EVER JOIN YOU!!! TAKE THIS!!!! THE CRIMSION SHOCK!!!!! SCARLET NEEDLE!!!!!! [KURAE!!!! SHINKU NO SHOOGEKI!!!!! SUKA-RETTO NI-DORU!!!!!!]" Milo burns his Cosmo and behind him, an aura of the Scorpio Constellation rises! Milo concentrates all his Cosmo into his right trigger finger, using it to send Red Cosmo Shocks right into the body of Sekhmet! "UWAHHHHHH!!!!!!!! ", screams Sekhmet falling on his knees in the ice from the pain of 2 needle wounds on his body. "Scarlet Needle create wounds that are small like needle holes but it gives an unimaginable pain. It is just like a shock given by the fierce poison of the Scorpion running all through your body! ", says Milo as he launches his Finish Blow again! "UWAHHHHH! ", roars Sekhmet as he gets hit with 3 more needle attacks! He crashes down on the ice, with his head piece of his Halo flying off for a distance! "The enemies who gets hit with this Scarlet Needle has only 2 things waiting for them. Madness or Death. Before all the 15 stars of the Scorpion Constellation gets driven into the body, the answer will come. Sekhmet! Which one will you have? Madness or Death!? ", says Milo as he hits Sekhmet with 4 more needles! Sekhmet crashes down on the ice again. He struggles and looks up at the Saint of Athena, "Mi... Milo... I won't go mad or die..."
"Huh! ", snares Milo, "We'll see!" and again, Milo sends 5 more needles shocks into Sekhmet! "GYAHHHHHHHHHHH!!!!!! ", screams Sekhmet. He is not screaming because of the pain. The pain is already unbearable. He is screaming because from the 14 Needles wounds, blood is spurting out in a gush like a flowing river! Milo says calmly, "Finally, blood is spraying from the wounds of Scarlet Needle..."
"SCARLET NEEDLE'S BIGGEST FATAL POINT!! ANTARES!! Antares, the Supergiant that represents the heart of the Scorpion Constellation. With all his Cosmo, Milo drives in the killing blow into Sekhmet! The Oracle gets hit but instead of screaming, he smiles! "HAH! ", groans Milo. This time it is Sekhmet sending a shock to the Gold Saint! "Ha ha ha...", laughs Sekhmet, "So this little skill is what won you the qualification of a Saint? Maybe, I over estimated your ability, Milo..."
Episode 12: Do Cvidanija, Siberia. "Impossible! ", shouts Milo. He can see the wounds he has made from his Scarlet Needle are gone! "Like I told you before, I won't go mad or die... When Zeus recognized us as a Oracle, we are given the Halo. The Halo is not just an armor. It has an ability that can regenerate our bodies." "What!? ", shouts Hyoga, "Then that mysterious power that I sense when I was wearing my Halo. It was that power!" "Yes, Cygnus, that is why I called your Cloths, useless. Compare to the Halo which is like the Garment of the Gods, your Cloths are like the shells of bugs ... And although I look like a man of 25 years of age, I've been alive for much longer than that..."
"What!? ", shouts Milo, "Then... you are saying you are immortal!?" "Ha! We Oracles who have already awakened the Eighth Sense are nearly as powerful as the Gods..." says Sekhmet proudly, "With the Halo, we are immortal!!! UWAHA HA HA HA HA!!!!!!" Hearing this, Milo thinks, "If I have the Libra Weapons or I am wearing a Kaiser Cloth, I can defeat him but I don’t have either... The only way I can defeat him is if I destroy his Halo totally, so he can't be healed again... "
But, Milo doesn't have time to contemplate what to do next, the Thundera starts to burn his Cosmo and behind him an aura can be seen: Bastet, the raging Cat of Egyptian Myth! "Milo! You don't even have time to regret your decision of not joining us!! Delos is Greek for 'Shining' so this move in English is 'Shining Heaven Claw!' In light speed, Sekhmet's right arm turns into a sharp claw of the tiger! His attack cuts into Milo, a million times over! In an instant, Milo's Gold Cloth is torn to shreds! The broken pieces fly all over the place, as the attack continues! "GWO WO WO WO WO!!!!!!! ", cries Milo. The Gold Cloth is no more! His whole body is being ravaged by Sekhmet's attack. The Gold Saint gets blown away, flying meters away, crashing to the ice ground! Seeing the total defeat of Milo, Sekhmet turns toward Hyoga and says, "Hyoga... It is your turn..."
"Huh! ", snares Hyoga, "Do you think a Saint like Milo would die just like that!" "Even if the Scorpion Cloth dies here, even if Milo perishes here, he will stand his ground and defeat you!!" "Really...", says Sekhmet calmly. He looks over at Milo. Milo is in fact not dead but struggling to stand back up again. "Such suffering for you, Milo...", says Sekhmet, "Let me be merciful and end it for you..."
can be considered NO MERCY!" "What!? ", shouts Sekhmet sensing Milo's Cosmo to the breaking point. "The place I trained to be a Saint, Milos Island, is famous for tools made out of Volcano Glass. Those tools are so sharp that they are said to be able to carve through anything!" "Sekhmet! I'll show you that you are not immortal!!" Hyoga can see an aura rising behind Milo, it is the form of a Volcano, but what's more important is Milo's Fighting Pose! Milo is not excending his finger to attack!! Instead!!! "FOR THE FIRST TIME, " shouts Hyoga, "MILO IS NOT USING HIS FINGER, BUT A PUNCH!!!!!!!!!!!" Milo rushes over to the Oracle and concentrates all his Cosmo into his right fist! 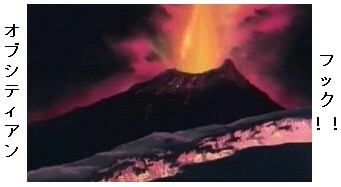 He launches a right hook straight at Sekhmet and the Thundera is like caught in the explosion of a Volcano! "GYAHHHHHHHHH! ", screams the Power Thundera as he get blown up by a big rising pillar of Cosmo sending him thousands of meters toward the sky! His Halo is blown to pieces, smashed to the point where even the atoms are destroyed! Sekhmet falls back down crashing through the ice, right into the water below! "Excellent... Mi... lo...", says the dying soldier of Zeus as his body is floating on the water, "You've pressurized all that energy of the 15 Scarlet Needle into one attack... So... this is... dea... th..."
"Milo! ", shouts Hyoga, rushing over to him. The Scorpion Saint falls into his arms. Hyoga holds him tight. "Hyo... ga...", says Milo weakly, "Looks like it's finally time to join Camus..."
"MILO! ", shouts Hyoga as he senses his Cosmo disappearing. "But before I die, I must tell you. Do you know who led me to become a Saint?" "...It was your Master, Camus..."
"Yes... Before I met him, I wandered the streets of Athens. I had no direction. I had no place to call home. I stole what I can so I can survive, living a worthless life. My body was alive but my soul was dead. One day, when I was 5, I met Camus who was also 5 years old at the time. He asked me, 'Do you want to continue like this or do you want to use your life for something greater?' He brought me to Sanctuary and I was sent to Milos Island to start my training... Through that training I was reborn... I was reborn into a..."
"Scorpion!" says Hyoga, full of emotion. "Yes..." smiles Milo, "Maybe Camus, unconsciously, felt I had the potential to become a Gold Saint, just like him... Your Master is a great man! Never forget his teachings! Never repeat your mistakes again! NEVER!" Hearing this, Hyoga smiles, "Milo! When my Mama brought me to see Mitsumasa Kido, she told me how great of man he was. How I should use all my power to help him. I never understood that then... But now I do... Don't get me wrong... I won't stop hating him, but I understand what my Mama wanted me to do... I understand now!" Hearing these words from Hyoga, Milo smiles and finally closes his eyes. Hyoga can sense his Cosmo gone, his life force non-existent, finally the Scorpion Saint has died. A Warrior of Love and Justice has fallen. With flowing tears from his eyes, Hyoga says to him, "Milo... Thank you and... Do Cvidanija..."
A Thundera has descended into the graveyards of Sanctuary. Right then, that Gold Saint appears! How did the Gold Saints survive the Hades War!? Will part of that secret be revealed!? Episode 13: Speed beyond Light! !